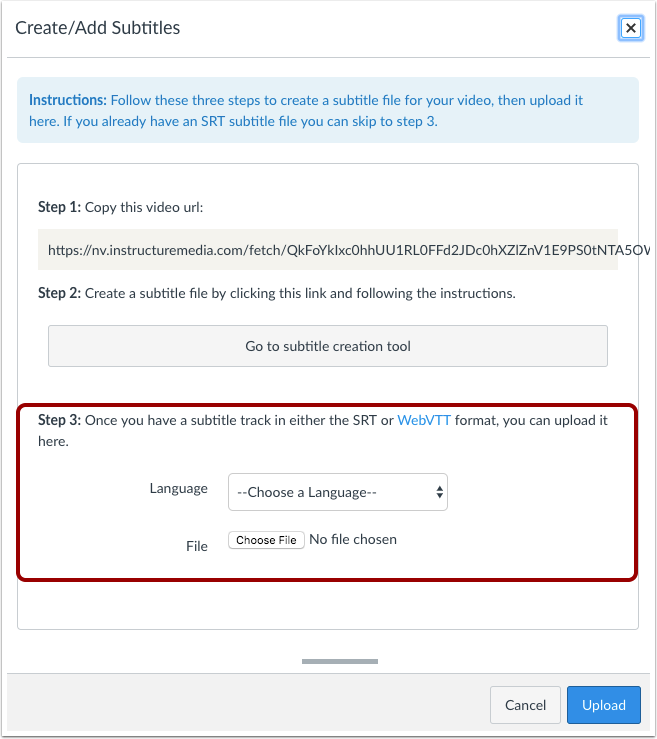 You can easily create and upload caption files when you add video content in the Rich Content Editor. The Rich Content Editor is used in features that support the editor (Announcements, Assignments, Discussions, Pages, Quizzes, or Syllabus). This lesson only applies to creating captions for videos created or uploaded into Canvas. If you've created a video outside of Canvas that you want to include in your course, learn how to create captions for external videos. If you have not yet created or uploaded your video, learn how to record a new video or upload an existing video. Note: Users can view video captions in the Canvas by Instructure mobile app. However, iOS devices can only display captions in WebVTT format. If you use another format besides WebVTT, users on iOS devices will not be able to display the video captions. Open the Canvas content page or assignment where you created or uploaded your video. Click the video to enlarge the window and open the closed-caption options. Hover over the closed caption icon . Click the Upload subtitles link . 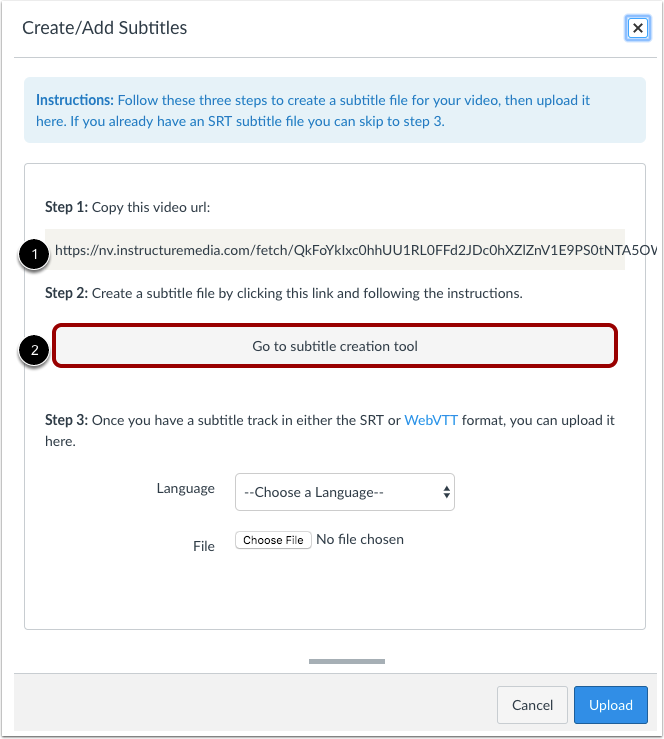 If you need to create a caption file for your video, copy the video URL , then click the Go to subtitle creation tool button . A new tab will open in your browser window. 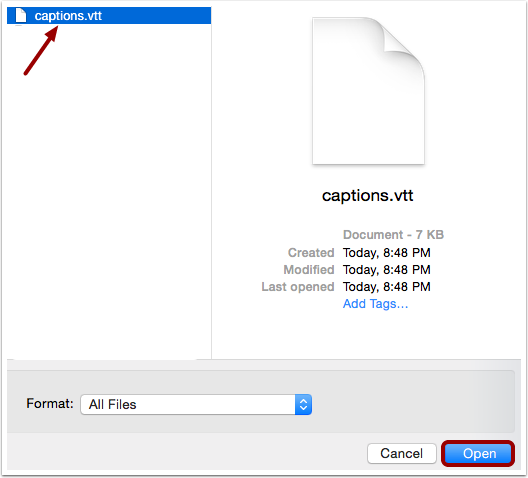 Learn how to create a caption file in the subtitle creation tool. When you are finished creating the caption file, you can return to this page. 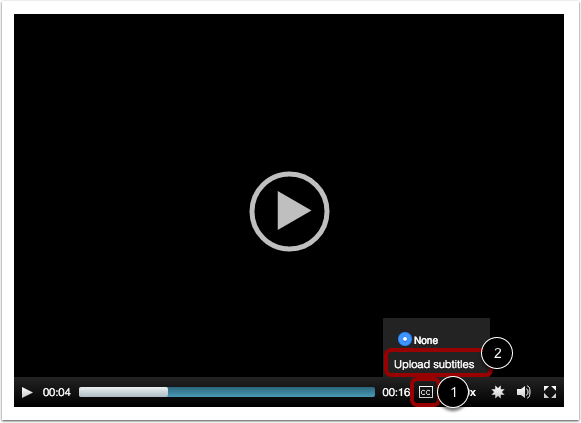 Note: Canvas must render the video and create a URL link before you can create a caption file. If you try to add subtitles and steps 1 and 2 are not yet available, try accessing your video later. If you already have a caption file, you can skip to step 3 and set the caption language and locate the file. In the Language drop-down menu, select the language that matches the language of your subtitle file. To locate your caption file, click the Browse or Choose File button (depending on your browser). Locate your subtitle file on your computer. Select the file, then click the Open button. To submit your subtitle file, click the Upload button. Canvas will confirm your subtitle file has been successfully uploaded. Refresh your browser window to view your subtitles. Previous Topic:How do I add captions to an external video as an instructor? Next Topic:How do I create a caption file using the subtitle creation tool as an instructor? Table of Contents > Rich Content Editor > How do I add captions to new or uploaded videos in Canvas as an instructor? Re: How to get captions/transcripts for Canvas videos?